soup for lunch . . . The other day, I posted a piece about umami taste and in particular about making a fragrant vegetable broth from scratch that I froze to use as a base for when I make soups or sauces. 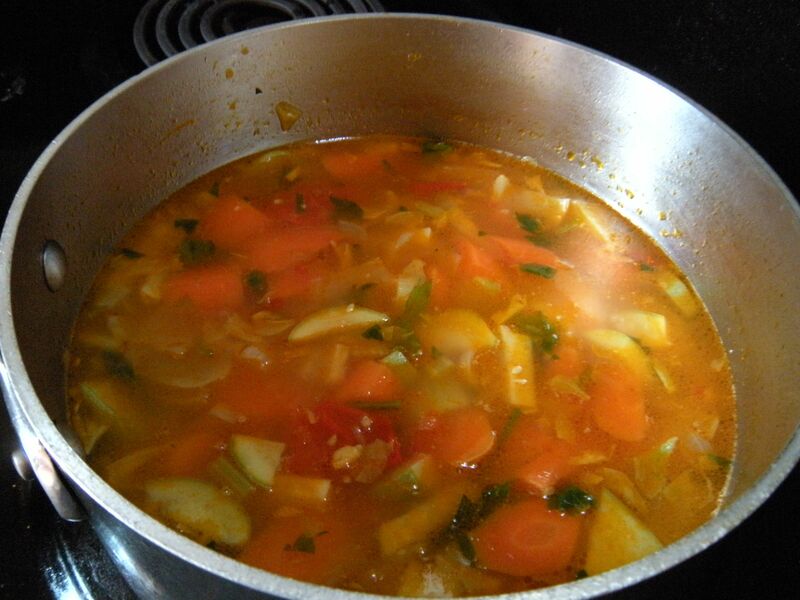 Cover pot and simmer until vegetables are tender but not overcooked. Add a few stalks of chopped fresh parsley towards the end. Serve with cold sliced ham, corn muffins and dark rye crackers with blue cheese. It’s supposed to be hot today, but this soup tastes sublime and is so easy to make on a slow summer day. I think it’s also a good candidate for repeat performances! When I make it again, I think I would keep everything the same except for reducing the celery and carrot to two instead of three. That would make the batch just right for two people to have a bowl and a half each of this delicious soup.